James is 18, and thus far too cool to have a bio. 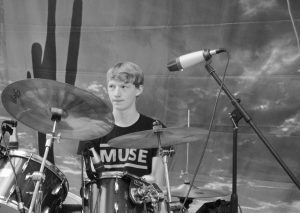 He has, however, been playing drums since he was 12, being taught by both Fozzy Dixon (The Contrast) and Spike T Smith (The Damned, Morrissey, many others). He lives in constant hope that Muse will someday release a country song, and in the meantime, persists in sneaking Dom Howard drum riffs into Sara Evans songs.